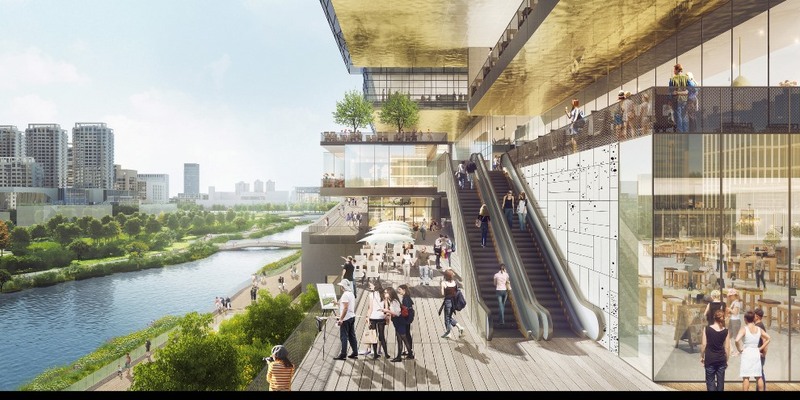 The London, England-based architecture firm Benoy recently won the international competition to design a waterfront redevelopment called INCITY MEGA for SCPG in Wenzhou, China. According to project spokesperson Yifan Huang in an email to REVITALIZATION publisher Storm Cunningham, “The project is outside the Green Axis Park on city empty lots, so there’s is no reduction in green space. In fact, with the SCPG project, the actual green ratio exceeds the official city requirement.” This was in response to Storm’s concern that the commercial and retail components might be infringing on the long-established green space. Following Benoy’s earlier appointment to complete the masterplan for eight land plots along the Central Green Axis of the city for China Vanke, this latest competition will see the firm now deliver the design for two key waterfront plots within this central masterplan. The 250,000m2 Wenzhou INCITY MEGA will be the first commercial complex in SCPG’s new ​MEGA product line. Both plots for Wenzhou INCITY MEGA are both located on the eastern side of the Central Green Axis. Plot D29 will be the site of the INCITY MEGA Mall while Plot D31, longer and more narrow, will form the future waterfront boutique district. The vision for the project is to deliver a ​”three-dimensional urban space”; an interconnected destination which blurs the boundaries between commercial and public realms. 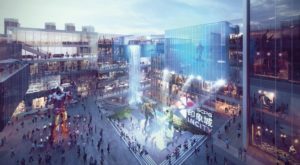 For the design of the INCITY MEGA Mall, Benoy pushed the external boundaries of the redevelopment outwards to create an impressive, multi-functional inner courtyard and open-space at the heart of the retail-led scheme. The multi-level development has been injected with open-air platforms overlooking the central courtyard, while the waterfront facing edge features a large promenade and multiple landscaped viewing decks. The waterfront boutique district on Plot D31 seamlessly connects to the INCITY MEGA Mall and brings a commercial offering to the mixed-use development. Three prominent glass structures sit above the scheme and will offer innovative commercial office spaces for business headquarters. 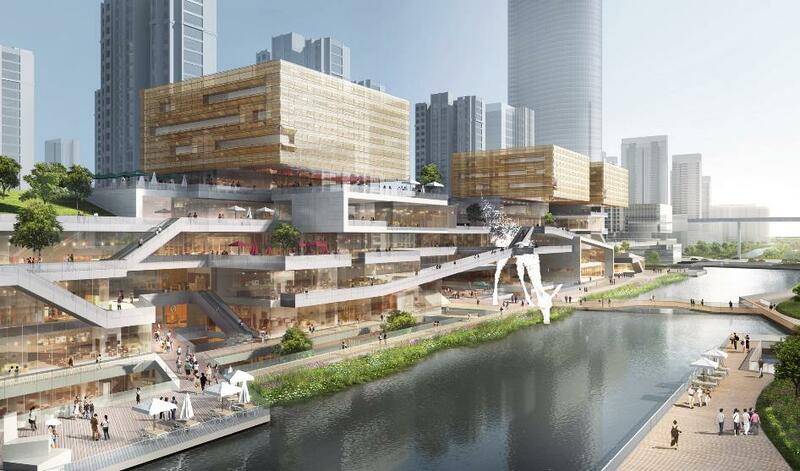 Below, the continued network of retail, dining and leisure attractions will form the lower floors of the development. Throughout the mixed-use project, the connection to the waterfront is central to the design. Enhancing accessibility and creating interesting pedestrian networks throughout has part of the design strategy. Commercially, large block structures have been interwoven throughout the development to provide attractive anchor spaces for tenants. Large-scale venues such as movie theatres, outdoor plazas and an ice-rink as well as a gym and swimming pool create strong leisure attractions and venues for a changing calendar of events. 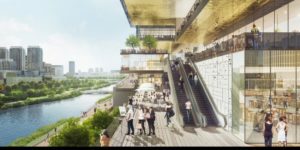 “What visitors will notice across the entire development is the connectivity to the waterfront and outdoors – not just on the ground floor, but as they rise through the development. The network of platforms, outdoor walkways, open-air bazaars and landscaped decks help create a unique environment which blends the water and landscape with the retail mall and commercial business space to create a truly first-of-its-kind destination in Wenzhou,” continued Qin. 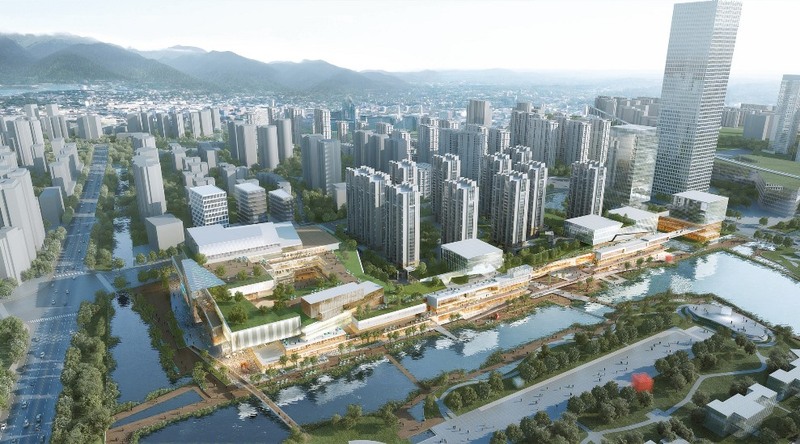 Essentially, Benoy’s design has aimed to meet the demands of a growing Wenzhou population and a new generation of consumer. Traditional offers such as office space and retail have been enlivened through a design which injects open-air plazas, terraces, landscaped decks, plazas, sports venues, theaters and public realm throughout. 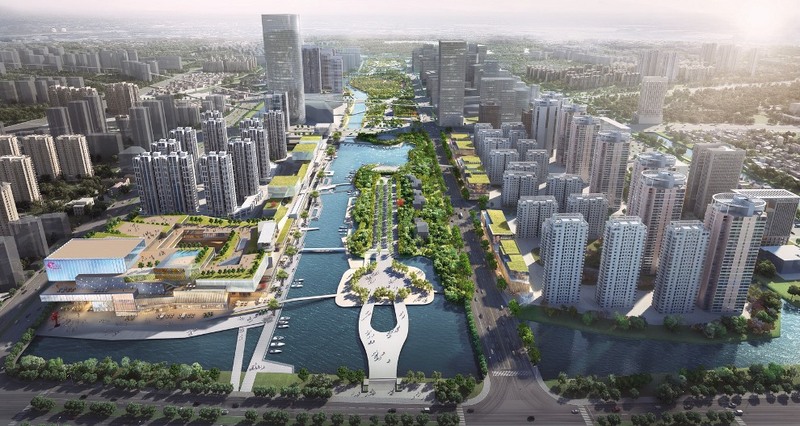 With a joint commitment from the government and the developers, Wenzhou INCITY MEGA will provide a strong benchmark for waterfront development in the city and a future jewel along the Central Green Axis. All renderings courtesy of Benoy.